We want you to have the best experience possible on our new website. Unfortunately, the browser you’re currently using is outdated. Follow the link below to easily get the latest version. Elegant enough for a cocktail party, yet hearty enough for game day, this quick and easy app is a crowd pleaser. This recipe is made with Jones Dry Aged Bacon. In small bowl, combine cream cheese and pepper jack cheese; set aside. Carefully remove the stems from jalapeños and cut each in half lengthwise and then again horizontally to make 4 pieces out of each jalapeño. Remove the seeds from the jalapeños. Spoon 1 teaspoon of cream cheese mixture into each jalapeño quarter. Wrap 1/3 slice of bacon around each cheese filled jalapeño quarter. Unroll crescent dough and separate into 8 triangles. Cut each triangle down the middle lengthwise, making 16 triangles. 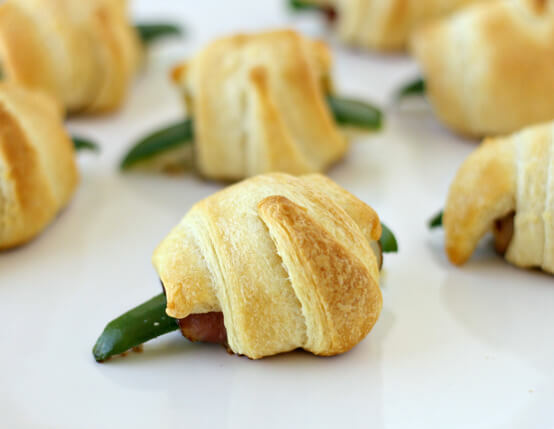 Roll one piece of dough around each bacon-wrapped jalapeño quarter. Place on an ungreased baking sheet and bake 12 to 15 minutes or until crescent rolls are golden brown. Remove from cookie sheet immediately and serve. Super easy and fantastic. Everyone at our super bowl party was asking about these. They were one of the first items to disappear - I should have made a triple batch! Thank you for your input. Your rating and/or review will soon be added. Create an account now, and future orders will be faster and easier. You’ll also have access to past purchases.